Korg UK has announced plans to hit the road this autumn, taking the company's entire range of analogue gear on a massive UK tour. The tour, which kicks off on 1 October, will see Korg showing off all its synths and grooveboxes at music shops across the country, with specialists on-hand to answer questions. According to Korg: "The entire analogue range will be present and correct including the Volcas, the Monotrons and the MS-20 Mini - their full capabilities will be demonstrated and you'll be invited to make a close inspection of the division. "Backing up the analogue contingent will be the big guns - the KingKORG & Kronos; comprehensively equipped, massive-sounding and ready for action in almost any arena." 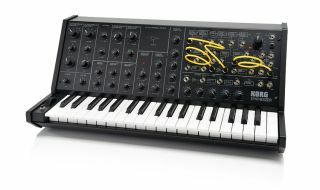 Everybody that attends the event will get a Korg goodie bag and be entered into a prize draw to win and MS-20 Mini.